Learn how to keep food fresh and make it last longer with these essential tips. If you are like me, you hate to throw away food that has gone bad. We found 14 kitchen hacks to avoid grocery waste so take a look and let us know if you have any tips to keep your food fresh longer. Buy what you think your family will eat that week. Plans change. Meals aren’t prepared as planned. Food ends up thrown away because it spoiled and went bad before you had a chance to eat it. About 40 percent of all food in the U.S. goes to waste. The average American wastes about $28 to $43 in food each month, roughly 20 pounds of food. Broken down, about 17 percent of dairy, 20 percent of vegetables, 15 percent of fruit, 18 percent of the grains, 25 percent of seafood, and 33 percent of the meat you buy goes to waste. I’ll do the math for you. That’s about $516 you could be throwing away every single year. 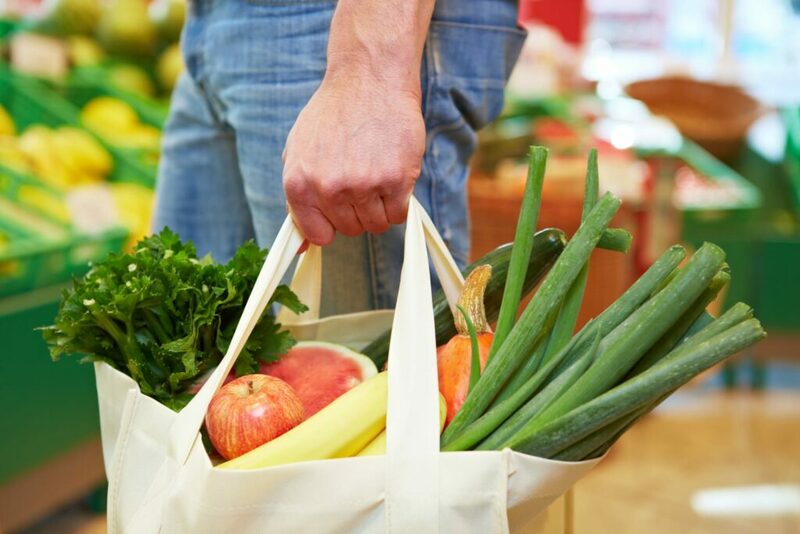 How do you keep your food fresh and your groceries last longer? Here are 14 tips that will help you save the food you buy from going bad. Some of these tips came from MoneyTalk News, written by Angela Colley and others from my own experience. When you get home from the grocery store, keep the fresh herbs in the thin plastic bag they came in. They will last longer in the vegetable crisper section of your fridge too. If you follow those three steps, the herbs will last an entire week. I actually learned this trick from my mother. She would buy a bag of onions, put one onion in the foot of a pair of pantyhose, seal it off with a twist tie, add another onion, and repeat until it was full. Then she hung the hose from a nail inside the pantry. Stored this way, the onions have more room to breathe and last a month or more. Do your spices and seasonings clump together? That’s a common problem in places with high humidity and can cause you to throw out otherwise still-tasty spices. But this classic trick will prevent clumps for good – add four to ten grains of dry rice to the bottle and shake it. With the rice inside the bottle, you will be able to keep your seasonings on the shelf for at least 6 months. What makes food stale? Air. Keep the following items in airtight containers to prevent them from going bad too early. The Snapware containers were fairly inexpensive to buy – I bought mine on Amazon. Do not store your bread in the fridge, it will dry out and go stale. Keep the air off your bread by keeping it in the plastic bag with a twist tie. Bread will last about 7 days after it is opened. Apples are one of the fruits that stay fresh the longest but did you know that when one apple goes bad, the rot can spread? Yup! Turns out the rot in just one apple can make an entire bunch of food rot with it. Look closely at apples before you buy them. And as soon as you see a rotten apple, throw it away. Your fruit will last a lot longer. Don’t let the apples touch each other to prevent damage and store them in the refrigerator. Before you have to throw away apples, check out these easy recipes using apples. Keep your cheese fresh by storing it in wax paper. The wax paper allows the cheese to breathe better, keeping it from molding or turning slimy. You can keep the paper wrapped tightly around the cheese in the fridge. It will last almost twice as long – about two weeks – before it starts going bad. How many times have you had to buy an entire pint of heavy cream, just to use 1/2 cup? Then, the rest of the cream goes to waste. Instead, freeze the leftovers in small quantities to use later. Pour the cream or milk into an ice cube tray (each section holds two tablespoons), freeze it, and toss it in a plastic container and label it. When you’re ready to use it, pull out just enough for the recipe and let it thaw. Lettuce will remain fresh and crisp for up to a week if you wrap it in a paper towel. You may need to change the paper towel along the way. The next kitchen hack will keep your lettuce fresh – no more soggy lettuce! After you buy lettuce from the store, wash, dry and chop all the lettuce as soon as you get home. After it is chopped, store it in mason jars. Then, you have readymade salads that will last up to 10 days. Fill your sink with water and 3/4 cup white vinegar. This vinegar solution will remove dirt, wax, and bacteria, which helps it last much longer. Does your celery turn soft when you store it in the fridge? Wrap opened celery in aluminum foil and the stalks will stay crisp for at least a week. Bananas last the longest if they’re stored in a warm, dry place, but they still turn brown more quickly than I can eat them. A friend suggested wrapping the top of the banana bunch tightly with plastic wrap. I tried it and it works. My bananas last another three days or so before they start to brown. Before you throw away bananas, check out these great recipes using bananas. Asparagus needs water or else it will dry out within a few days. The best way to store asparagus is to wash and dry it first. Then, wrap the bunch in damp paper towels. That will keep it fresh without cutting off the oxygen and they will stay crisp longer. What if you lose power or your fridge dies? How do you keep your food fresh without a fridge? This article outlines exactly how to live without a fridge – it can be done! Basically, fresh fruits and veggies can be stored at room temperature for a short length of time. About the only foods that really require refrigeration are cooked foods, dairy, and raw meats. Which of these kitchen hacks will you be using? If you enjoyed these kitchen hacks, here are some more home tips that will help you save money and time. Do you have any tips to keep your food fresh longer and avoiding grocery waste?